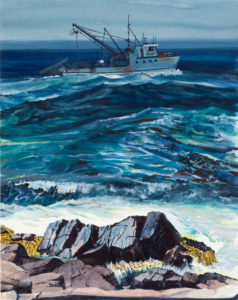 Michael Torlen has been painting on Monhegan for the past twenty-four summers. He works outdoors, at the water’s edge, observing closely and capturing quickly, in watercolor, both the details and the moods of the rocks, sea, and sky. Close to twenty of these plein-air watercolors will be on view, several of the painted this past summer. Torlen is professor emeritus of the School of Art and Design, Purchase College, State University of New York. He has shown widely and has work in the collections of several museums, including the Housatonic Museum, the Neuberger Museum of Art, and the Springfield Art Museum. “I work in two styles. I make landscape-inspired works, Songs for My Father—as paintings, prints, and watercolors. I also have a body of work—Sanger Fra Mor, narratives which place a cast of characters in dislocated and remembered surroundings hinting at themes of life, love, and death. Songs for My Father is dedicated to my late father, a Norwegian commercial fisherman. I have painted the landscape, a long-standing Nordic subject, in and around Acadia National Park, and have worked on Monhegan Island, since 1995.